By the thousands, they were once commonplace on the American frontier. Large western freight wagons did more than just carry their weight, they built and sustained some of the most demanding and harsh regions of the U.S. Individually and collectively, they were as big as the dreams they carried. They were dreams of personal and corporate success; firmly committed to the task at hand; dreams built by hard work and tenacity and driven by a desire to excel. It's easy to look back from the comfort of our modern conveniences and minimize the everyday challenges associated with operating these big rigs. But, the reality is these men, beasts and machines ruled the road. To illustrate that point, let's consider just a few of the dozens of questions we could ask. Things like… How do you negotiate sharp turns on steep, narrow mountainous terrain when the full length of your train – including horses/mules/oxen and wagons – can easily stretch 100 - 200 feet in length? How do you maintain control while descending long grades with full loads? Finally, when the wheel weighs several hundred pounds more than you do, how do you manage any repairs on the trail that might require it to be removed? Clearly, there was a tremendous amount of strength, skill, finesse, wisdom and experience necessary to command an early freighting operation. Large and in-charge, these no-nonsense designs were especially rugged and built for strength. I never cease to be impressed with their varied designs and mammoth construction features. While many of these imposing machines were built by major manufacturers like Studebaker, LaBelle, Weber, Schuttler, Jackson, Fish Bros., Joseph Murphy, Louis Espenschied and others, it's not unusual to find surviving freighters that were created by small, little-known shops as well. Not long ago, I was able to examine another of these behemoths. This one, believed to have worked in Idaho during the 1860's, is also felt to have been a local creation. Inside, the reinforced sideboards are significantly worn, gouged and scarred from years of hard use. The heavy flooring and sides are matched by equally substantial, hand-forged ironwork. End gate supports and latches are heavy-duty, hand-forged finger links. The box, itself, stretches 15' 6” in length and is 44” wide (outside to outside). The depth of the box is 38”. It all makes for over 170 cubic feet (over 6 cubic yards) of hauling capacity. Looking at all of the structural statistics, it's possible this rig would have regularly been loaded with materials twice its own weight. 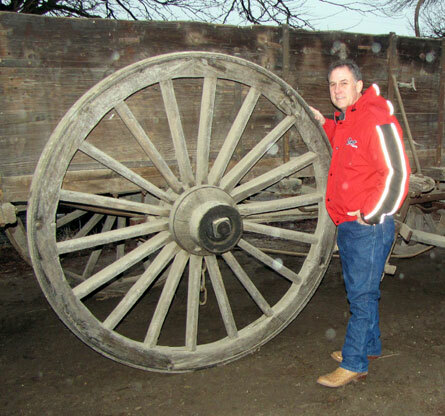 It's an impressive thought since, standing empty the wagon alone weighs almost 6,000 pounds. Its rear wheels top out at a full six feet in height and the tires are 4” wide. The oversized hubs have an equally impressive girth, measuring 48” in circumference and 19” in depth. Felloes, spokes and tires are further reinforced with spoke and tire rivets, 4 ½” shoulders on the spokes and double rear tires, each measuring ½” thick. 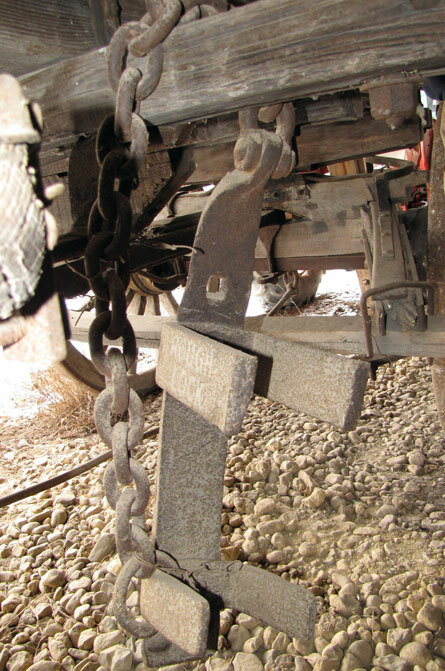 Interestingly, while the front of the freight wagon box sits on a traditional-style rocking bolster, the rear is positioned directly on top of the steel reinforced rear axle, with no evidence a bolster was ever used on the rear sections of the wagon gear. The design creates a gradual slope rearward. It's a configuration that leaves us to speculate as to the purpose. Perhaps it was done to help shift some weight off of the front turning gear, assist with offloading, or maybe some other reason entirely. The wooden portion of the rear axle beam is a full 7” in height and 5 ¼” in width. Track width is approximately 65”. Just behind the rear axle, a hand-forged horn and bumper show plenty of use from trailering additional wagons. Incredibly, the surviving and worn brake blocks on this beast are handmade from sections of trees and stretch out 29” in length. It's a big number that comes to 40% of the total wheel height! The original drag shoe for this vehicle has also survived and is still with this wagon. From the looks of the bottom side; it has seen its share of downhill action. 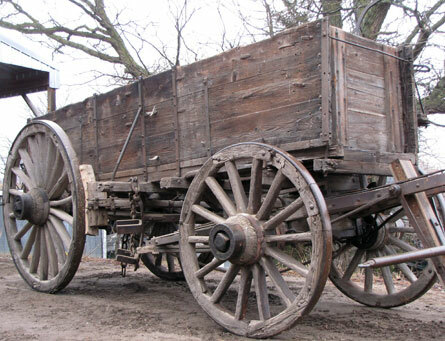 Knowing this wagon weighs 3 tons empty and that it could have easily doubled its weight under a load, it's incredible to think of the circumstances where so much mass is sliding down a steep mountainside with perhaps at least one other wagon behind and another in front. 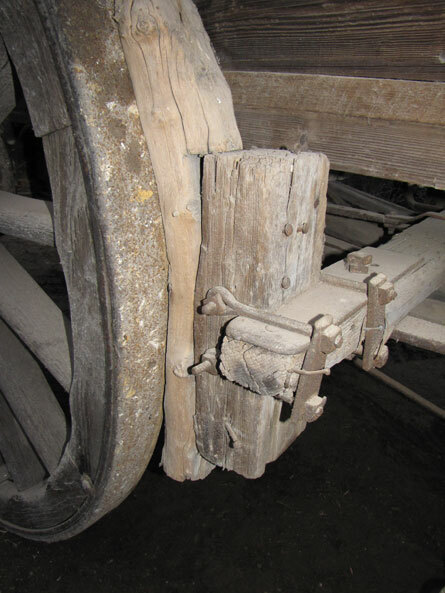 Equipped with the stereotypical long-shanked brake lever of many early freighters, the left side of the wagon also includes a wooden platform from which the brakeman would have stood. In many cases, control of such a train required an intuitive skill level and personal constitution that could give adrenaline junkies cause to pause today. Elsewhere, the circle iron above the front hounds is equally noteworthy. These sections of forged metal are a full 1” square. Clearly, there is nothing small about this design. For years it labored; week in and week out, straining to perform, absorbing the pressures and taking on more than its share of hard knocks. Today, it stands in silent testimony, relegated to a legacy often overlooked and seldom fully understood. The glory days of seeing thousands of these monstrosities at work are long gone; their teamsters have followed the same path. Except for an occasional static display, demonstration, or parade, these witnesses to and participants in the making of America have done their job. In the process, they reinforced the spirit of the west and built a model for shipping and supply-line logistics that continues to be a vital part of the American dream.